This well appointed studio apartment is an ideal base for anyone wishing to enjoy Stratford's many and varied attractions. The bay window overlooks the narrowboat moorings alongside a canalside pub in the centre of town, next to the canal basin where canal and river Avon meet. The spire of Holy Trinity Church can be seen from this window. 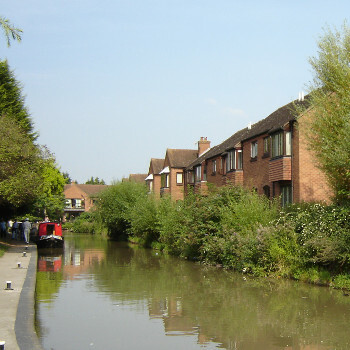 The apartment is within comfortable walking distance of all that Stratford has to offer; Theatres, Shakespeare properties, markets, shopping, restaurants, river walks and boating, gardens and much more. The refurbished apartment is light and airy with ample space for sleeping and relaxation with a well equipped kitchen. The shower room has a low flush toilet, wash basin,shaver point and heated towel rail.The sofabed is a state of the art model that converts into a comfortable full sized double bed with down duvet and pillows (hypoallergenic alternatives available on request). There are modern design pleated blackout blinds to aid a good night's sleep. We have equipped the apartment with a selection of CDs, DVDs and books to ensure a "home from home" feel after sampling the delights of Stratford. There is an LED TV (Freeview) with integrated DVD player and USB port. All linen and towels are included in the rent as is all electricity. You will find the dedicated free parking space a real boon in central Stratford. The apartment is within easy walking distance of all shops, Marks and Spencer food hall is just across the road. The dining table expands for a full dining experience. We provide plenty of glassware and serving dishes. We even provide a champagne bucket, oyster knife and lobster/seafood set for that romantic occasion. A picnic basket and chairs are provided, very welcome for open air theatre and cinema performances during the summer months. The apartment is fully serviced prior to arrival and the key holder will meet you in order to answer any questions you may have about the apartment. Golf and fishing are within walking distance as is tennis. There are guided bus, river and walking tours available all year round. An event not to be missed is Shakespeare's Birthday celebrations during the week of 23rd April. Stratford upon Avon is surrounded by beautiful countryside dotted with picturesque villages, castles, historic country houses and gardens. Europe's largest butterfly farm is less than a 5 minute walk away.